How Do Acupressure Mats Work to Help Relieve Back Pain? » How Do Acupressure Mats Work to Help Relieve Back Pain? Back pain is more than simply annoying. Chronic back pain can be downright debilitating to your daily activities. If you suffer from back pain, any relief is welcome. But what if that relief meant lying down on a sharp bed of plastic needles? While resting on a “bed of nails” certainly sounds like an unpleasant experience, more and more people are choosing to do just that. This new and popular health trend is called acupressure, and many people swear that it provides unparalleled back pain relief. Acupressure is the process of applying targeted pressure at very specific areas throughout your body, such as the bottom of your foot, the palm of your hand and more. Unlike massage, which focuses on large groups of muscles, acupressure therapy targets small pressure points with precision. For best results, you’ll probably want to hire an experienced acupressurist. He or she will know what specific pressure points to target in order to provide the best relief. A professional will use their hands, elbows and special massage tools during the therapeutic treatments. Acupressure can also be done on your own. As long as you’re careful, you can apply gentle pressure to specific points on your body using your fingers. The results likely won’t be as effective as what you’d get from professional sessions, but as long as you don’t press too hard there’s very minimal risk of injury. Folks primarily interested in at-home acupressure therapy often use an acupressure mat. In just the past year or so, acupressure mats have experienced a sudden surge in popularity, as they’ve turned up in a variety of health and beautify magazines and even been praised by one of the Real Housewives of New York. So, while the idea of acupressure treatment is thousands of years old, the mats are a relatively new experience for many people. An acupressure mat is a foam mat, similar to a yoga mat, but with one major difference. Acupressure mats have thousands of short plastic needles. And while these needles won’t break the skin, they’re extremely sharp. Most mats arrange the needles into small circles consisting of about a dozen individual needles. These circular patterns are very distinct. As you might expect due to the item’s current trendiness, mats are available in a wide variety of colors and styles. Almost all of them also roll up for easy transport. In order to understand acupressure, we have to look at its close cousin: acupuncture. Existing since 100 B.C. or possibly even earlier, acupuncture involves inserting thin needles into the skin at key points. Acupuncture is used to treat a wide variety of issues including muscle pain, stress, digestive problems, weight gain and much more. How acupuncture actually works depends on who you ask. Traditional Chinese medicine believes acupuncture helps balance the flow of energy (chi) throughout your body. Inserting needles into specific points of your body helps the chi flow along your body’s meridians. Different needle entry points correspond to different body lifelines, allowing the treatment to target a variety of problems. Western medicine typically agrees that acupuncture can provide health benefits, but they have different reasons as to why. They believe inserting the acupuncture needles at specific points in the body stimulates nerves, muscles and connective tissue. This type of stimulation might trigger the release of natural painkillers within the body. Acupuncture should only be performed by a qualified professional. This means you’ll need to schedule sessions whenever you want treatment. Even if the acupuncturist comes to your home, arranging an appointment can be a hassle. Many people prefer the simplicity of at-home acupressure treatments. Plus, acupressure is 100% puncture-free, which is great for anyone uncomfortable with needles. Don’t worry. You don’t simply unroll the mat onto the floor and immediately lie down. Instead, you follow a three-stage process to slowly acclimate your body to the acupressure needles. First, you’ll start by draping the mat over a chair or sofa cushion. When sitting, your back will press into the mat. This introduces your body to the sensation of the plastic needles against the skin. During this stage, you’ll sit for about 10 to 15 minutes. After two or three days, you’ll probably feel ready to move onto stage two. Now you’ll place the mat horizontally on your sofa. Then you’ll lie down on the mat anywhere from 20 to 45 minutes. The extra cushioning from the sofa reduces the pressure against your back. Finally, advanced users can place the mat on a hard surface like a wood floor. This will provide virtually no cushioning effect, so you’ll experience the acupressure needles at maximum intensity. You’ll only use the mat this way after first conditioning your body over time in the other two stages. You can lie on the mat for 45 minutes or more. What Does Using an Acupressure Mat Feel Like? Using the mat for the first few times will likely feel a bit strange but not unpleasant. During the first five minutes, you’ll probably feel a stabbing sensation. This is the most painful the mats will probably ever feel. Remember, this is an entirely new sensation for your skin, so your body needs a few minutes to adapt. After five minutes or so, the pain will likely be reduced dramatically. Instead, you’ll feel a pleasant warming, tingling sensation. Many people compare to feeling to that of an icy/hot type balm. After about 20 minutes, your back will probably start to sting, which indicates you should sit up. After you stop using the mat, your back will likely feel stiff and hot for about a minute or two. It’s sometimes compared to the feeling of a sunburn (only without the lasting damage). Then shortly that sensation should be replaced by a noticeable decrease in pain. Even severe back pain will usually be significantly reduced for about a half-hour after using the mat. Many acupressure mats include a small cushion for your neck. While this can be effective for treating neck pain, many people find acupressure neck cushions uncomfortable. The neck typically adapts to the feeling of the needles at a slower pace than the back. If the neck cushion continues to be uncomfortable, feel free to replace it with a traditional cushion. Will an Acupressure Mat Help with My Back Pain? Although everyone is different, many people swear that acupressure therapies have helped reduce or eliminate their back pain. The mats are used to treat basically any type of muscular or skeletal related back issue including sciatica and even stress-induced pain. Acupressure mats work in two ways. They provide immediate relief in the short-term. If you feel a painful flare-up developing, use the acupressure mat for a quick recharge. Additionally, regular use can help reduce chronic pain over time. Aside from back pain, acupressure also treats a variety of other physical and mental problems. Regular use of the mat has been shown to reduce insomnia, headaches, foot pain, gastrointestinal issue and more. Because you can use the mat at home on your own, it’s often easy to find 20 to 45 minutes for daily use. Acupressure mats might seem a bit strange at first, but they’ve become a popular trend in treating back pain because many people are having great results. 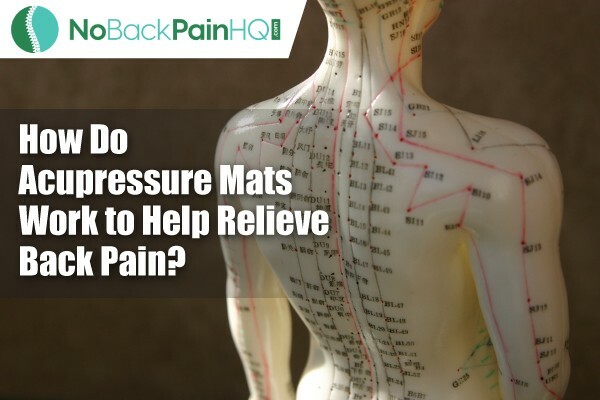 Safer than prescription medications, easier than physical therapy and less invasive than acupuncture, acupressure mats can be an effective solution for chronic back issues. Previous Post Do Acupressure Mats Help with Fibromyalgia? Next Post What Are the Health Benefits of Using an Acupressure Mat?